We receive a great deal of email from our happy customers. This page is admittedly a bit boastful, however, we want you to read what the ring owners have said. So here goes… comments from all over the world. The rings are great and we both love them! Thanks so much. It’s so amazing, that I have to buy another ring from you!! I love the lightweight feel to it, which is so much nicer than metal rings! We got the ring today and it’s PERFECT!! Thank you so so very much!! You guys are awesome!! Oh my goodness they are LOVELY! Thank you so much we are really really happy with the rings, they are beautiful and really special. We received the ring yesterday, and it is perfect. We really appreciate the craftsmanship and level of customer service! We will be recommending you to our friends and family. Thanks again! I just received the ring and it is beautiful! Thanks again so much for your work on this ring. You have been amazing! Thank you for guiding us through this process. The rings are wonderful! I just wanted to say thanks again for everything! …we’ve grown to love our rings so much that we don’t want to part with them. …we’re officially engaged. She loves the ring as does everyone that sees it- she gets compliments all the time! Thank you so much for all of your help and for making such a special ring! …just received the ring and it is absolutely beautiful! I am so impressed with both your workmanship and the ease of process towards the final product. You have been a pleasure to work with but most of all your rings are stunning and are worth every cent! Thank you so much for your help. You have been wonderful, because you have answered all of my questions and have gotten back to me so quickly! I will tell others all about you! Thank you for your good service and most beautiful rings! I’ve just received the rings this morning! They’re lovely! Wow! I am so lucky I found you guys! 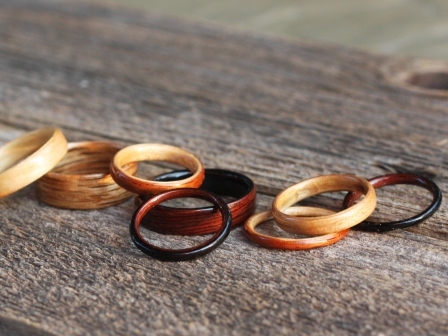 I have been looking online for the perfect wooden ring for months and finally I found it! I cannot believe how durable they are. I wear mine everyday, and it still looks new. I love the ring! It is so beautiful! My ring is so light, I forget that I am wearing it. Thank you for your incredible craftsmanship. It hard to believe that a delicate piece of wood can be this strong, and beautiful. Incredible, that was quick! And the ring is beyond belief. I will tell my friends all about it! 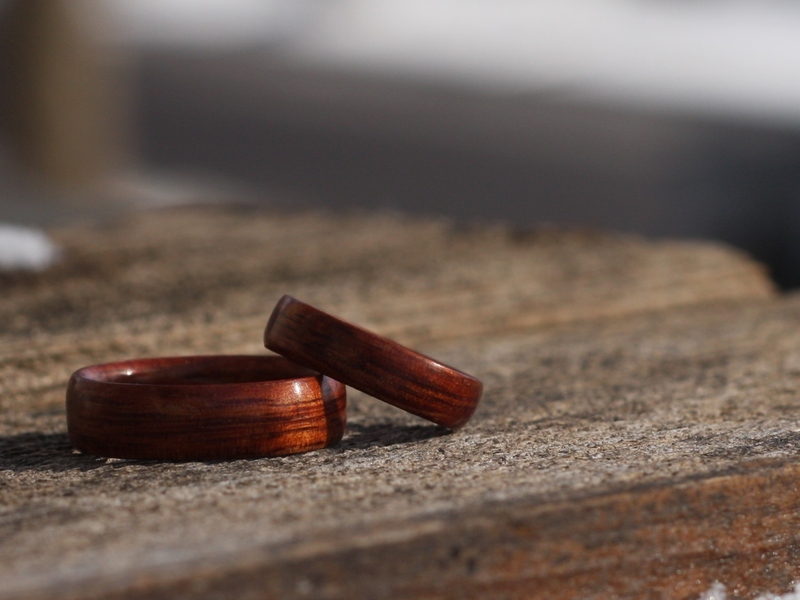 We could not be any happier with the way the rings turned out. They are SO beautiful! You are amazing, thanks so much! Thank you so much! We are so excited to get it back! We really appreciate you going above and beyond to make sure it is just right.